Update: Starting Ubuntu 17.10, you won’t get a new 32-bit ISO download for default version of Ubuntu. Existing 32-bit Ubuntu install will still be able to upgrade to newer versions and most likely they will be supported till 2023 (i.e. the end of life for Ubuntu 18.04 LTS). Various Ubuntu flavors are still providing 32-bit install though. Yesterday, developer Dimitri John Ledkov wrote a message on the Ubuntu Mailing list calling for the end of i386 support by Ubuntu 18.10. Ledkov argues that more software is being developed with 64-bit support. He is also concerned that it will be difficult to provide security support for the aging i386 architecture. Ledkov also argues that building i386 images is not free, but takes quite a bit of Canonical’s resources. scalable build-farms, i386 still requires all packages, autopackage tests, and ISOs to be revalidated across our infrastructure. As well as take up mirror space & bandwidth. Ledkov offers a plan where the 16.10, 17.04, and 17.10 versions of Ubuntu will continue to have i386 kernels, netboot installers, and cloud images, but drop i386 ISO for desktop and server. 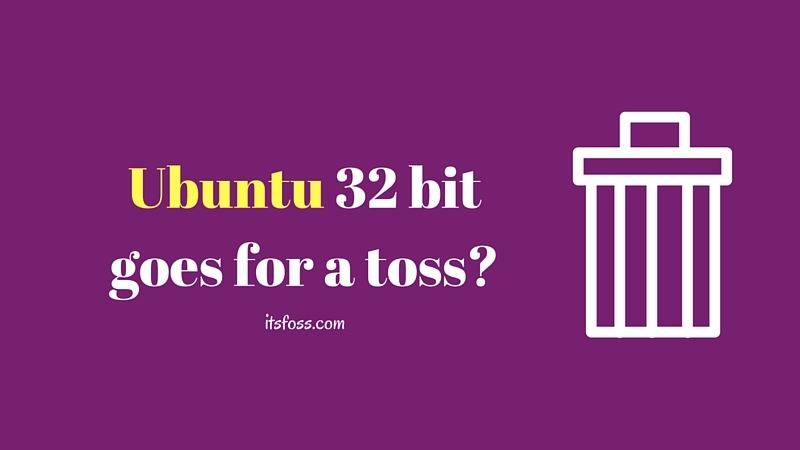 The 18.04 LTS would then drop support for i386 kernels, netboot installers, and cloud images, but still provide the ability for i386 programs to run on 64-bit architecture. Then, 18.10 would end the i386 port and limit legacy 32-bit applications to snaps, containers, and virtual machines. Ledkov’s plan had not been accepted yet, but it shows a definite push toward eliminating 32-bit support. Don’t despair yet. this will not affect the distros used to resurrect your old system. Martin Wimpress, the creator of Ubuntu MATE, revealed during a discussion on Googl+ that these changes will only affect mainline Ubuntu. The i386 archive will continue to exist into 18.04 and flavours can continue to elect to build i386 isos. There is however a security concern, in that some larger applications (Firefox, Chromium, LibreOffice) are already presenting challenges in terms of applying some security patches to older LTS releases. So flavours are being asked to be mindful of the support period they can reasonably be expected to support i386 versions for. I understand why they need to make this move from a security standpoint, but it’s going to make people move away from mainline Ubuntu to either one of the flavors or a different architecture. Thankfully, we have alternative lightweight Linux distributions. Will this move affect you? What do you think of it? It is sad that I finally have to abandon my Acer Netbook. I can no longer get a decent 32-bit kernel, but I can no longer get 32 bit apps. I am looking to upgrade to a Chromebook for $200-$300 that will allow me to have a small footprint portable machine for writing and testing code. The smallest Chromebooks are 11.1″ so I have to not only buy new hardware but travel bag, etc. to carry the Chromebook that won’t fit in my 10″ Targus bag. *sigh* Suggestions on the pros and cons of alternatives are welcome. At least there is a $99 400GB microSD card that can provide enough storage to make the Chromebook usable. Separately I have asked Dropbox (since Microsoft does not support Ubuntu for OneDrive), to make the “files on demand” feature available on a smaller footprint version of dropbox (e.g. 200GB) so that even a 16GB flash drive on Chrome is usable for a developer. I have an old netbook that is running just fine with Linux Mint 17 with xfce – it can’t handle a 64 bit OS. I use this little guy for traveling. Some really old hardware still has life left. So I hope there will always be a distro for those systems. They’re basically saying: “Main Ubuntu releases aren’t meant for old hardware anyway, so using all these resources to make these images isn’t very useful.” Wouldn’t worry about a thing really. I mean 18.04 right? That’s gonna be a while.